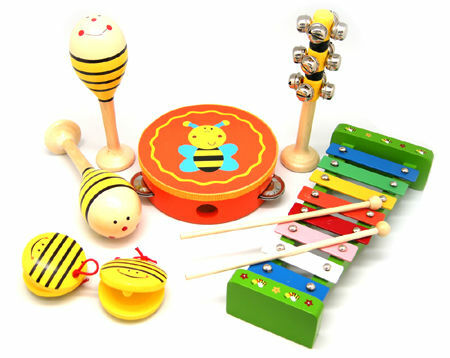 Wooden 7pcs Music Set Bee is a wonderful wooden collection of musical instruments beautifully decorated with a bee theme. It contains a pair of Maracas, 2 castanets, bell stick, tambourine and xylophone with 2 beaters. The xylophone has a wooden base and 8 metal notes for a consistent tone. Material: Wood Child-safe paint, metal keys. We like this because: "Musical Instruments and bees... perfect! "